So I'm discovering.. If this works, I'll order 2 more for the other 2 ceiling fans as the dining room fan is starting to slow down a bit.. I think my wall switch may have an issue but is not burnt as far as I can tell but I am looking into possibly replacing the dimmer switches with regular on/off switches instead. That's the same one I found on Amazon. If the other is slowing down the capacitor is probably going bad in that one as well. It doesn't take much of a change to mess up the speed, those motors don't even run without the capacitor, the capacitance used changes the phasing of 2 coils to get the motor to turn at various speeds. You don't run the fan on a light dimmer, do you? The wall switches for fan control have the 2 larger capacitors in them, so you just leave the fan set on high and the wall switch kicks in the 2 other caps to lower the speed. A light dimmer basically switches the power on and off very fast to change the brightness, that is bad for capacitors. The fan switch on the wall has 3 settings; slow medium, fast. I have the fan switch on the ceiling fan set to fast. The light switch has its own seperate dimable switch though the LED bulbs are not dimable..
OK, then it was just a bad capacitor then. I've got LED bulbs in mine also, I've tried various dimable LEDs but it's a crap shoot if they dim much. No LEDs seem to dim down very far, seems like half way is typical, with some that might go down to 1/4 as bright, below that they just turn off. Definitely better buying a new capacitor than a whole new ceiling fan. Yeah that's why I'm considering going back to regular switches because the LEDs flicker at certain positions on the dimable switches..
Less a project/task and more an exercise in going completely bonkers. I thought I lost one of my flash drives earlier and I totally lost it(mostly because my dad's accounting is backed up on it). My bipolar goes from a 7 to 10 depending on the time of day and my mood shifts so this incident just cranked my mania up to 11. Anyways I looked EVERYWHERE. I looked in the dresser in my closet, I looked in this little case I keep all my little stuff in, i looked in my drawer in the kitchen, in every drawer in my room, I looked everywhere I could possibly place a small silver rectangular object on which the stupid little plastic piece broke off so I can't attach a wrist strap to it anymore. Anyway, I finally realized... hey wait a minute... what's that plugged into my PS3? I realized I just transferred some Rifftrax shorts from my flash drive to my PS3 and I left it plugged in there. The only reason I could hardly see it is because the end is black and it's practically invisible against the black of the console unless 1) you're directly looking at it, and 2) WITH a flashlight. I felt so damn stupid. Then I realized something else... the floor was wet. I realized in moving around the furniture near my fridge, I managed to accidentally unplug my fridge and barely noticed. Meanwhile, all the accumulated ice on the cooling element had already seeped out to the point where I needed to get a bath towel to dry everything up inside the fridge and on the floor. This day sucked and I can't wait to put it behind me. Here's Part 1 of my ceiling fan issues..
Capacitor arrived for that ceiling fan yesterday and got it wired in.. Next I'll remount the ceiling fan and test it out. Also been wrapping up my Spring cleaning/rearranging my house project..
Got both office computers (my late wife's computer that was in the dining room, and the receptionist computer that was in my living room) both moved into my front room/office. Both are wired up on a switch and all the office supplies have been cluttered in there as well (still sorting through all that). All that's left is to move the 2 leather recliners my parents gave me a few years back out of my bedroom and into the living room, and then move the receptionist desk from the living room to the bedroom for the time being till I figure out what I'm gonna do with it; keep it or sell it. The house looks a lot different than what I was used to the last 17 years. Replacing some of my original outdoor CCTV cameras with night vision/IR cameras. Replaced 2 so far but need to get 2- 25 feet extension cables to relocate 2 others to the front corner of my house; 1 to catch a blind spot in front of my house, the other to get a good front view of my Mega Shed/Tiny House.. I'm removing a couple cameras inside my house that were used when we had the small business taking up 3 rooms in my house but now it's consolidated into 1 room so a couple interior cameras are no longer needed and would be better served outside but don't feel like removing a bunch of wire nails in the attic just to re-route the 2 needed cables so getting the 25 foot extension cables for under $10 dollars will be much easier. The door to my attic is a size no one makes a good ladder for, so I went with lightweight one made for much smaller openings, it's not the most sturdy thing but it works. Ended up taking way longer than expected to install, all to do with the door. 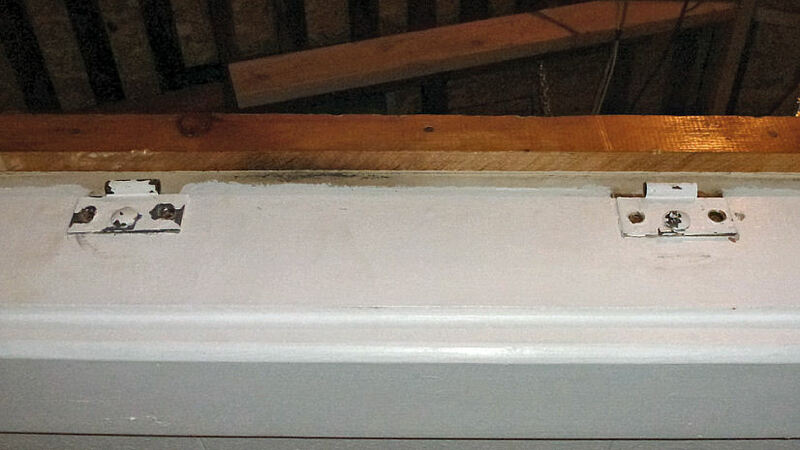 There were bits of an old (probably 1940) ladder bolted to the door, so had to remove those. I needed to have the door open from a different direction because the way this ladder works it slides up onto the attic floor behind the opening, and behind the hinge side of the door was the chimney. Because what ever was used for the old ladder relied on the door hinges for support they were carriage bolted in, and now that there is flooring put down I couldn't get to the other side, couldn't drill them out because they started spinning, so it was cutting wheel on the dremel time. Because the door is large and the latch that comes with the ladder kit was plastic I put a screen door closer on to help take some of the weight off. In the stowed postion, there is a rod with a hook you use to pull it down and is also used to rotate the latch on the door. My house was built in 1938 and it only had a 2ft x 2ft opening in the walk-in closet.. 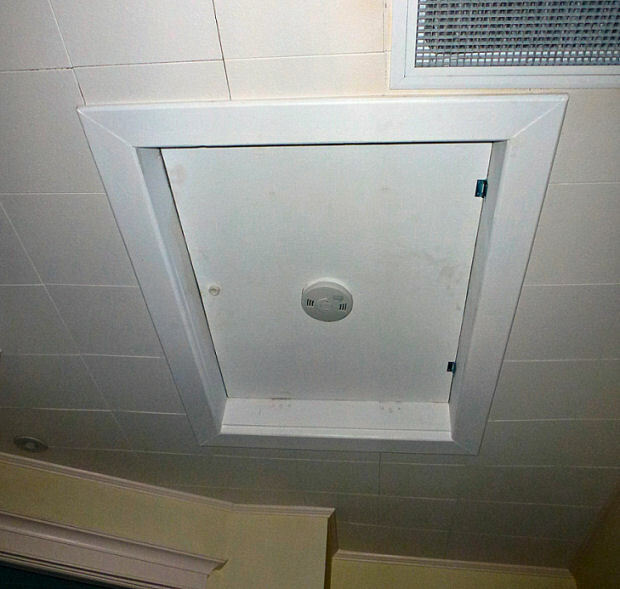 I had an attic fan installed in that opening and a bigger opening created in the kitchen back in 1996 when I bought the house, then an actual attic door with folding ladder installed 10 years later when the kitchen was redone. I couldn't find a folding ladder for an opening less than 54 inches long, and most of them are 25 inches wide. The opening I have is 43 inches long and 30 1/8 inches wide. I could find a few 30 inches wide but still 54 inches long. There are electical wires running on each end of the opening so making larger would be a pain, even without the wires it would still be a big job to add almost a foot to the opening. 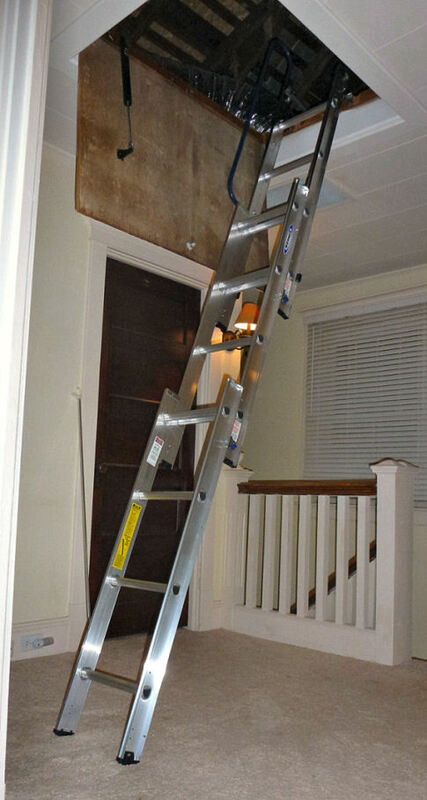 This ladder is designed for a 20x24 inch opening, that's why it takes up floor space in the attic behind the opening. 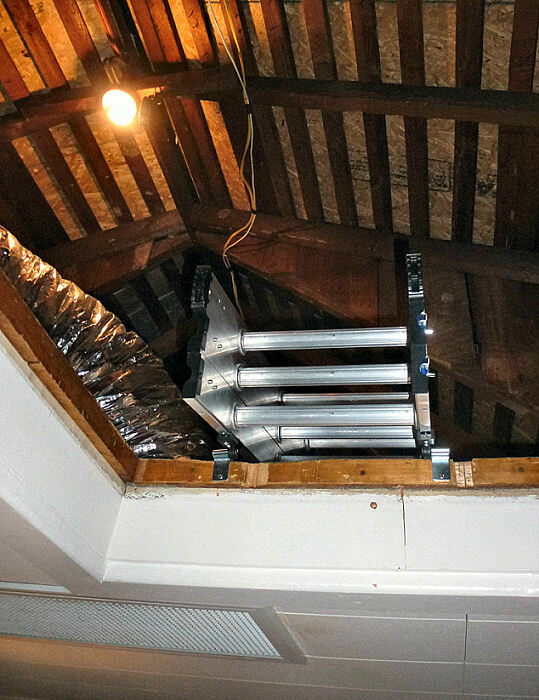 I thought about mounting this ladder to the door, it would have worked and have been less of a hassle but those hinges I had to cut off were facing the wrong way, with the A/C unit next to the chimney if you climb up that way you would have to climb around the opening to get to the open area of the attic. Yeah not worth modifying that opening just for a particular dimension attic door.. I may have to get something similar if I ever get Central Air/Gas Pack Heat installed in my house as I have very little crawl space under my house and any ventilation duct work would have to be run in the attic.. Though estimates for a 2 1/2 ton unit would be running around $6000 installed so that's obviously on the back-burner for the time being.. 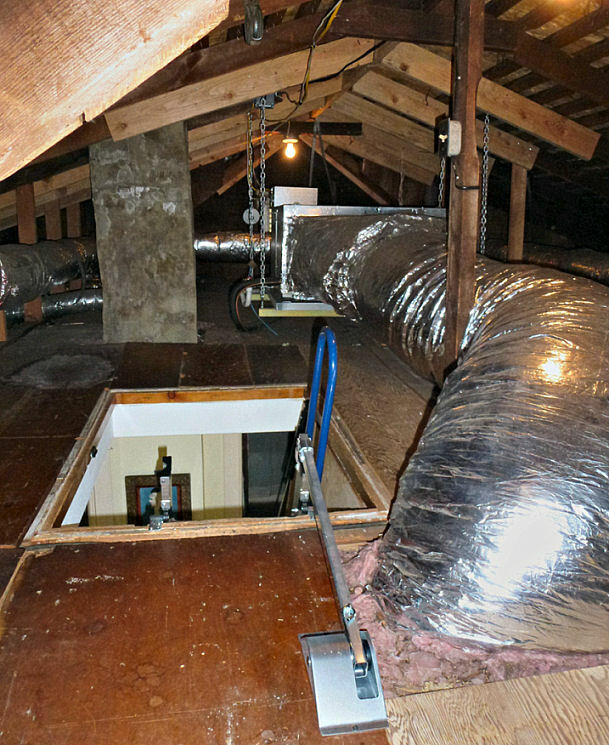 The unit isn't that big, it's a small attic, house has only about 1000 square feet that needs cooling.